Frances N. Brockington, soprano, is a native Detroiter and favorite to area audiences. In 2005, Miss Brockington received the prestigious Msgr. Daniel Ryan Award as Outstanding Former Faculty from Sacred Heart Major Seminary College. In 2000, she was named Outstanding Classical Vocalist of the Year by the Detroit Music Awards. Miss Brockington has appeared with a number of Metropolitan Detroit musical organizations; among them The Cathedral Cultural Series, the Brazeal Dennard Chorale, Rackham Symphony Choir, Cantata Academy, Michigan Opera Theatre, Great Lakes Lyric Opera, Orchestra Detroit, and the Detroit Symphony to name a few. She has also appeared as soloist nationally and internationally. Miss Brockington is equally at home as an operatic specialist, and as an actress. Her operatic repertoire includes “A Bayou Legend” by William Grant Still [aired on Cablevision to critical acclaim 2004 – 2006], La Traviata by Verdi, La Boheme by Puciini, Le Nozze di Figaro by Mozart, Candide by Bernstein, I Capuleti ed I Montecchi by Bellini, and Emperor Jones by Gruenberg to name a few. Recent years have found her as soloist in Elijah by Mendelssohn, Requiems by Mozart, Faure, Verdi, and Rutter, Messiah by Handel, and the Great Mass in C by Mozart; again to name a few. 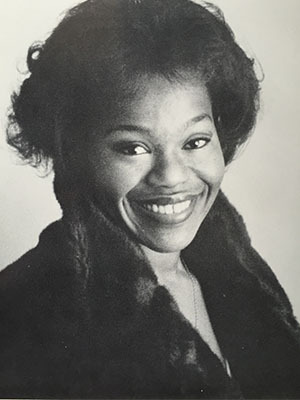 Miss Brockington, Associate Professor of Voice in the Department of Music at Wayne State University, maintains an active private studio and performing schedule in addition to her duties at WSU. She is director of music at St. Margaret of Scotland Catholic Church. After a long association with the National Association of Pastoral Musicians and the Catholic Archdiocese of Detroit, she remains a valued advisor to both organizations. Miss Brockington has served on the National Steering Committee for Cantor Certification sponsored by the National Association of Pastoral Musicians. Formerly, she was the Director of the Cantor Certification Program for the Archdiocese of Detroit, one of the first formally organized programs in the country. She has also appeared as clinician, keynote speaker, and Master teacher for these organizations. Miss Brockington holds the designation of Master Teacher and is in frequent demand as an adjudicator regionally, nationally, and internationally. Education and community service has always been of importance to Miss Brockington. She serves as President of the Board of Directors for Joy Preparatory Academy [K-8 charter school academy] and President of the Board of Directors for Artspectrum [a fine arts organization]. She is author of A Troubleshooter’s Voice Manual and Singers On The Move both published by Oregon Catholic Press. She co-wrote and performed in “Music Tells it Like it Is” and “All About Our Voices” both children’s operas currently being utilized by a number of education departments within national opera companies. Miss Brockington, always a champion of contemporary music, has been fortunate to premiere works by 20th and 21st century artists. In October 2008, Miss Brockington had the honor of premiering “Instructions for Elijah” music by James Hansen and libretto by Myra Sklarew for soprano, chorus, and orchestra. During this same performance, “Let There Be Music” and “The Urge” music by Michael Bryce was also premiered. Miss Brockington commissioned these works by Messrs. Hansen and Bryce and wrote the lyrics for “Let There Be Music”.